This salad combines some of our favorite things about summer: crisp mixed greens, sweet corn, juicy tomatoes from the garden, and homemade BBQ sauce. The sauce includes mangoes, apples, brown sugar, paprika, a chipotle pepper, ketchup, lemon juice, and a few other likely suspects. After it simmers on the stovetop and takes a spin in the blender, it becomes a little sweet, a little smoky, and a little spicy. 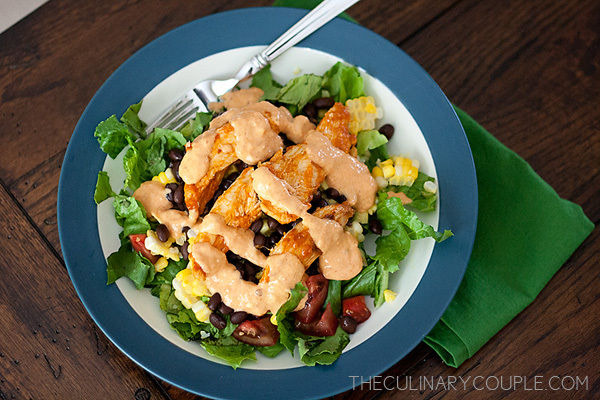 Whisk together a few tablespoons of the BBQ sauce with a dollop of plain Greek yogurt and a squeeze of lime to make the dressing. Then marinate the chicken breasts in the remaining sauce. Grill the chicken, cook the corn and cut it from the cob, and chop the remaining ingredients. 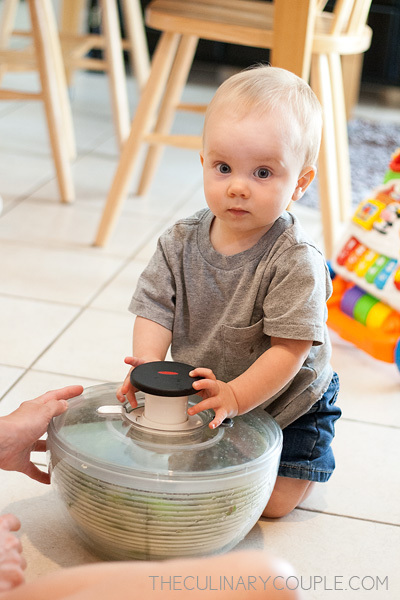 Then politely ask your mini sous chef to clean the mixed greens. 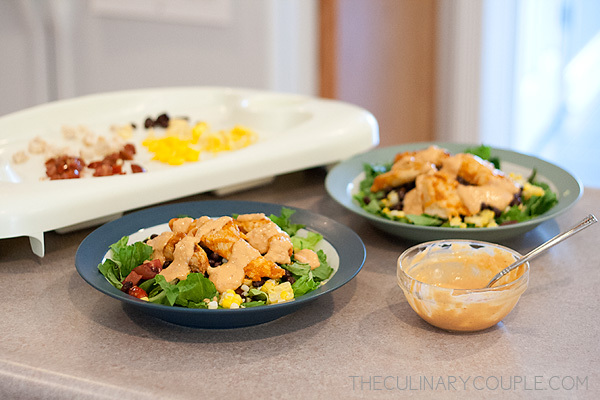 Divide everything evenly among two plates — and the tray of a high chair — and drizzle the dressing on top. And it is Sam-approved. 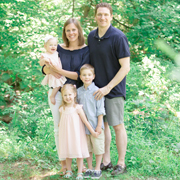 Husband-approved, too. Makes 2 large salads + a munchkin meal. 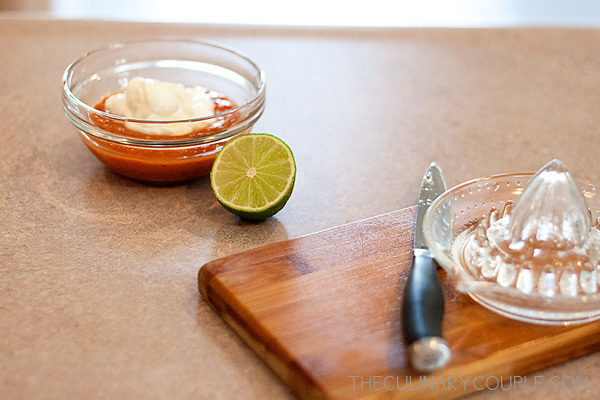 For the Chipotle-Mango BBQ Sauce: Combine all ingredients in a saucepan. Bring to a boil, then lower heat and simmer for 15-20 minutes, stirring often. 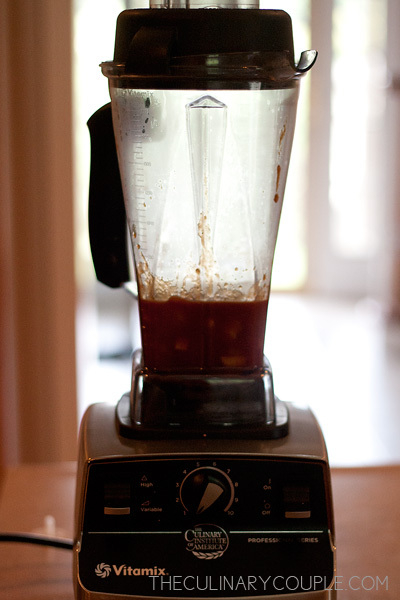 Let cool then transfer to a food processor or blender, and process until smooth. For the dressing: Whisk together all ingredients in a small bowl. Add salt and pepper to taste. Refrigerate until ready to use. For the salad: Marinate chicken breasts in the remaining BBQ sauce for at least 15 minutes, or up to 3 hours. Grill over medium-high heat for 5-6 minutes per side until cooked through. Allow the chicken to rest for 5 minutes before slicing. 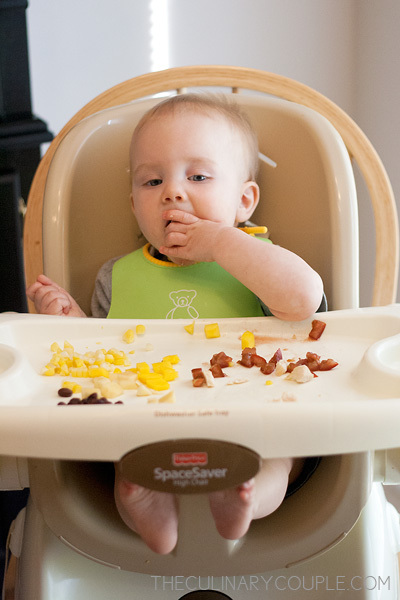 Divide salad greens between two plates (and a high chair tray! ), then top with corn, tomatoes, cilantro, and grilled chicken. Drizzle prepared dressing on top. Oh Em, you made my day: I just spotted the lemon squeezer I sent you a few years back. It’s something so little, but to know that you use it makes me happy! Let’s finally try to skype soon. I miss you.